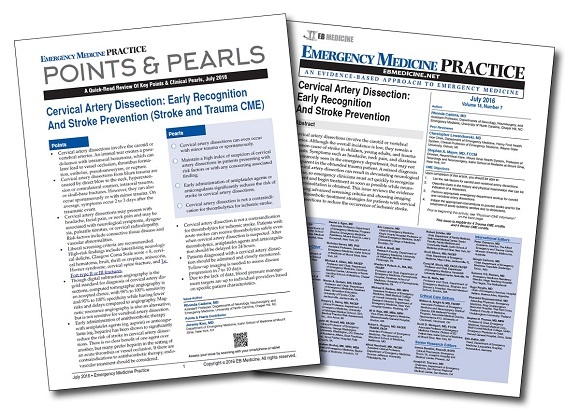 Specialty CME Credits:: Included as part of the 4 credits, this CME activity is eligible for 4 Stroke CME, 4 Trauma CME, and 1 Pharmacology CME credits, subject to your state and institutional approval. You arrive for your shift in the ED on a busy Friday night. Your first patient is a 29-year-old man who was a restrained driver in a motor vehicle crash, where he ran off the road going 75 mph. He was intubated on the scene for airway protection. On examination, he has a GCS 6T score, a large scalp laceration, symmetric pupils, and he withdraws all extremities from painful stimulation. His cardiac, pulmonary, and abdominal examination is without significant findings, and his extremities have scattered abrasions. His initial trauma imaging included a portable chest x-ray, a noncontrast CT head and cervical spine, and a CT of the abdomen/pelvis with contrast. The CT head showed a diffuse axonal injury and a temporal bone fracture. The remainder of the imaging showed no significant traumatic injuries. You wonder: What else should be done at this point? What are his biggest risks right now? Should I be concerned about the temporal bone fracture? After reading this article, I will consider dissection more often in trauma. 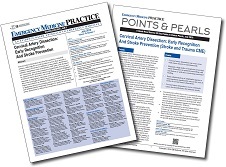 This article helped me have a higher index of suspicion for carotid and vertebral artery dissections in patients with minor trauma and lateral neck pain.